To equip Swiss machine tool builder Tornos’ new 6-spindle MultiSwiss CNC lathe with an advanced numerical control capable of meeting a wide range of sophisticated requirements. These included full multi-spindle versatility and the ability to control axes and spindles simultaneously to deliver superlative precision. Fit FANUC’s cutting-edge 30i CNC. Featuring the latest drive and control technology, the 30i guarantees incredible precision across a vast range of machining processes. Programming and operation via user-friendly interfaces has designed to be especially easy. Available with long or short beds, MultiSwiss provides a highly productive alternative to single-spindle machines. Designed to produce small turned parts, it is ideally suited to the automobile, electronics, watchmaking and medical technology industries. "For the control of our machines, we need CNC and drive systems that guarantee high-performance and that we can depend on 100%. Also on our new MultiSwiss, we cooperated with FANUC at a very competent technical level in a spirit of partnership." A highlight on the Tornos exhibition stand at EMO 2011 is the new multi-spindle turning machine, MultiSwiss, equipped with a FANUC Series 30i CNC. It complements the existing product range in the basic and mid-range segment. An integrated industrial PC makes it user-friendly and very flexible, thus it is suitable for both small and large series. "The new multi-spindle MultiSwiss from Tornos comes very close to single-spindle performance" – that was the assessment of one of four turned parts specialists who were allowed to test the MultiSwiss, inside and out, six months prior to market launch. This assessment in no way implied "single-spindle" productivity, but rather the superb ergonomics, as well as the easy operation and programming of the MultiSwiss, which is comparable to the characteristics of a single-spindle turning machine. It means that the new multi-spindle machine can also be used economically for small series. In producing turned parts, the main priority is to achieve the lowest unit costs possible – naturally, whilst fulfilling quality specifications. In order to achieve an optimal cost level, the turned parts manufacturer first of all must make the right choice of machines. He has to decide whether he would rather produce the parts on a single- or multi spindle machine, on a turning-milling centre or on a transfer machine. This depends on a multitude of factors. The requested unit quantity or annual lot size plays a key role. But the complexity and size of the work pieces are also decisive in the machine selection. An additional important point in the calculation are the machine costs. In order to make the right selection, the user best consults with his machine supplier, who ideally has a wide portfolio of turning machine available and can thus advise his customer with a wide range of options. The Swiss machine tool manufacturer Tornos S.A. is highly qualified in this regard, offering a variety of single- and multi-spindle turning machines for a wide range of diameters and complexity. Its multi-spindle range starts with the very successful SAS16.6 cam-controlled turning machine for basic, mass-produced parts with a diameter of up to 16 mm. For larger parts and medium specifications in terms of complexity and volume, the CNC-controlled MultiDeco and MultiSigma are a logical choice. After all, the MultiAlpha series can totally machine even complex components, including milling tasks, threads, etc., and offering in particular the option of complex reverse-side machining. From autumn 2011, Tornos is offering turned parts manufacturers a new turning machine under the name MultiSwiss. With six spindles and a 14 mm bar diameter, this machine complements the SAS16.6 and MultiDeco. The MultiSwiss is very flexible and designed for both small and large series. In the small series range, it is also a very productive alternative to single-spindle machines. The target sectors are the automobile, electronics, watchmaking, and medical technology industries, where basic, small turned parts are required. 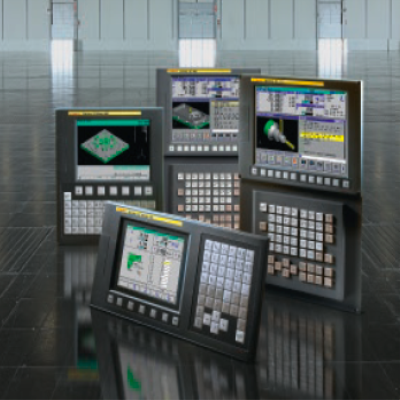 The control of the MultiSwiss machines – as with MultiAlpha- and MultiSigma turning machines – is handled by the FANUC Series 30i CNC. Product Manager Lionel Perret on the relationship to the control partner FANUC: "For the control of our machines, we need CNC and drive systems that guarantee high-performance and that we can depend on 100%. In all the years that we have been cooperating with FANUC, these requirements have been fulfilled completely. Also on our new MultiSwiss, we cooperated at a very competent technical level in a spirit of partnership." Tornos developers are especially attuned to four characteristics: flexibility, ergonomics, precision and costs. With the latest drive and control technology, FANUC delivered the right level of assistance, in order to guarantee the customary high precision, and to make the operation and programming as easy as possible. The MultiSwiss is equipped with the high-performance Series 30i CNC, a control that excels through superb high-performance hardware. It contains the latest ultra high-speed processors, a fast internal bus and a high-speed servo control. 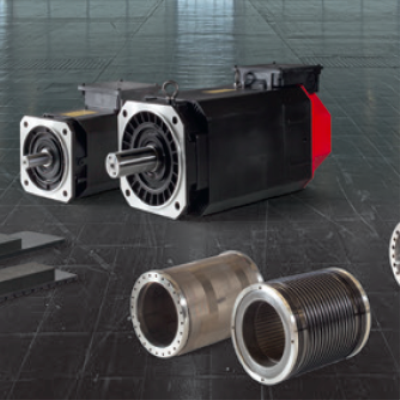 The high number of available channels enables the system to make a separate channel available to each of the MultiSwiss spindles. An ultrafast PMC processor also contributes to the fast and smooth running of any peripherals involved in the entire process. For the first time, with the MultiSwiss, Tornos is equipping a multi-spindle machine in a standard version with an integrated industrial PC. This development, promoted jointly with FANUC, offers the user numerous advantages. Because the FANUC 30i CNC communicates with the industrial PC via FANUC's own serial optical High-Speed Serial Bus HSSB, which guarantees high speed transmission and a virus-free and dependable connection. The most important reason for additionally equipping the system with a PC: The user can deploy the Tornos proprietary, user-friendly TB-Deco software on it. TB-Deco is a programming software with a graphically animated interface that assists the user in generating and optimising subroutines in multiple ways. It communicates with the FANUC software PTO (Path Table Operation – see text box), which is offered by the Series 3xi CNC controls. With the MultiDeco machine, the use of TB-Deco was restricted to external computers. Only the integrated industrial PC now enables the use of this software on the machine. Lionel Perret explains: "This has the advantage that the machine operator can make modifications in subroutines immediately on-site. He saves the trip to the PC and the transfer of the entire NC program." With the MultiSwiss, the user can call up TB-Deco on the control screen and receive programming guidance from the software. In many areas, this is visually assisted, which is particularly user-friendly. The axis and spindle resources, for example, are displayed to the user, who can best optimise the machining and cycle time parameters. Graphical synchronisation and axis locking are also possible. In this, TB-Deco uses some common functions from the Windows world such as Copy/Paste, Search/Replace or Help with search function by pressing "F1". Following the programming procedure, TB-Deco converts the input data into a binary format. This data can be read by the CNC via the PTO function and used for machine control. The interface PC, coupled with the control, also facilitates the integration of "third-party software", such as process and tool monitoring from Artis. Instead of a separate display, the software on the MultiSwiss utilises the convenient touchscreen of the control. Thanks to the quick coupling with the CNC, the Artis system can directly retrieve information there concerning torques and electrical power. When certain predetermined limits are exceeded, the system sounds an alarm or stops the machine, in order to prevent further damage. Even non-digital axes can be monitored via sensors. For a perfect machining result on multi-spindle turning machines, the axes and spindles must move simultaneously with utmost precision – e.g. for the flying handoff of the work pieces from the main spindle to the counter-spindle. With the function, Path Table Operation (PTO), which FANUC provides in the high-end CNC Series 30i and 31i CNC controls, precise interpolations and synchronisations can be achieved that are unattainable in any other process. The basic structure is straightforward: A two-column table is created for each axis and spindle. The first column contains the time unit in milliseconds for purposes of synchronisation. In the second column, and axis or spindle position to be reached in this time interval is assigned to the particular cycle. In this manner, all the axes are synchronised in a standardised interpolation cycle. With the PTO, the axis positions can be combined independently of all parameters. Unlike with the "normal" NC programming via G commands, this enables random paths and movements to be generated. In addition, it is possible to bundle several axes, and to assign their tables to various channels, in order to achieve interpolations in different forms of movement. Through synchronisation, however, an exactly identical start and end point are guaranteed. Help functions receiving commands in ways similar to the access movements can also be integrated into the Path Table Operation. It is even possible to override the channel structure, in order to move axes that on first glance appear unrelated. This is helpful, for example, in bar feeding. In addition, various tables can be linked and executed in sequence. Depending upon the various events, skipping of tables (If...then loops) are also possible. With the sequential mixing of NC programs and PTO, the user can simplify the programming of constantly repetitive procedures.